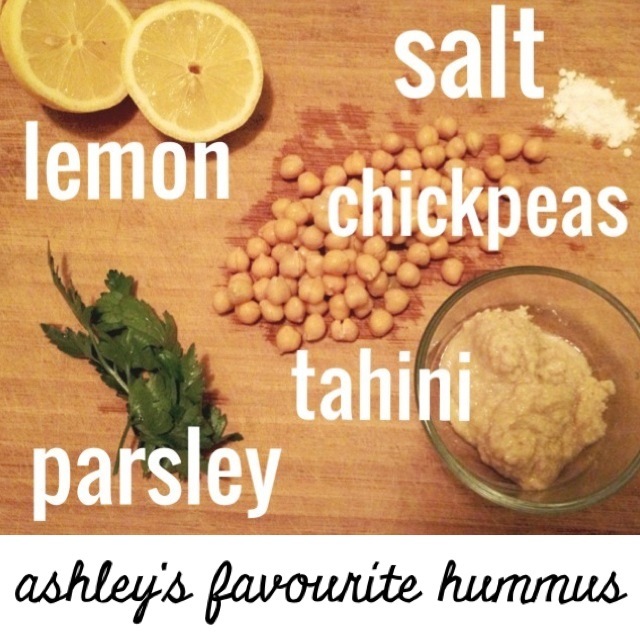 My hummus-partner-in-crime (Ashley from the blog Dancing Through Life) is back with her favourite hummus. We have exchanged so many hummus text messages this week for Vegan MoFo, it’s not even funny. 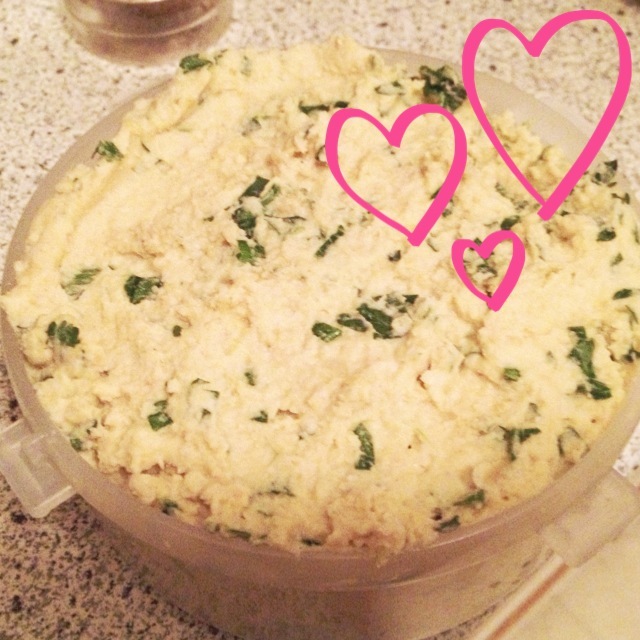 I’m so excited to get to taste this hummus tomorrow, I think the parsley would be a great addition to hummus — in fact, I could see myself using big handfuls of it in other hümmi! And I had no idea parsley was so good for you! Enjoy! I think one of the reasons I love hummus so much is because it is so versatile. You can basically throw it on anything, and in most cases, the original dish will be at least 25% better as a result of its new chickpea friend. This hummus was inspired by my favourite store bought hummus, the Jerusalem by Sunflower Kitchen. The parsley and lemon work incredibly well together and this hummus is an important reminder that parsley is more than just a garnish – it’s full of vitamins A, B, C and K, along with being a stellar antioxidant. Add all ingredients except parsley to a food processor. Mix until smooth. You might need to scrape down the sides a few times to achieve optimal hummus-consistency. Add chopped parsley and pulse until just combined and parsley is equally distributed. Enjoy the hummusy goodness on whatever your heart desires! One of my favourite ways to use hummus is actually on salad. By doing this, hummus takes on the role of protein kick AND salad dressing – definitely win – win! For this salad I tend to use whatever veggies I have hanging out in my fridge, but this is a pretty standard mix. The sunflower sprouts are one of my favourite parts! Combine tamari and apple cider vinegar in a bowl. Add tofu and marinate for at least 30 mins, longer if you plan ahead! I try to do this the night before and let the cubes marinate overnight. While tofu is marinating, assemble veggies (except sprouts) into a happy configuration. Add hummus on top of veggies. Add oil to pan and sauté tofu cubes until browned on all sides. 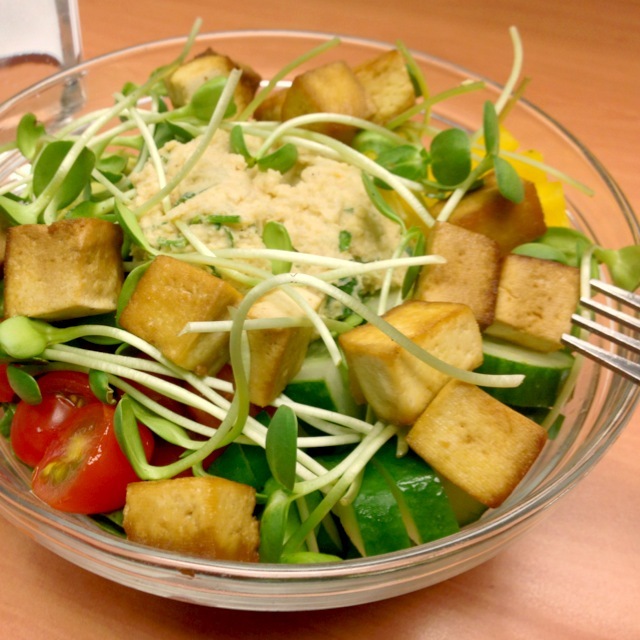 Top salad with tofu cubes and then garnish with sprouts to your hearts content. Ashley and I use the “A Beautiful Mess” app to add pretty things to our photos. It’s fun! I have no idea why I’ve never thought of putting parsley in hummus. genius. And where does one get sunflower sprouts? Or do you sprout them yourself? One of our local health food stores has a huge selection of sprouts, including sunflower sprouts. But any sprouts could work here! This looks delicious! And I LOVE sunflower sprouts. I had them for the first time a year ago at a restaurant and fell in love immediately. Parsley hummus! So easy; I don’t know why I’ve never done that before. Also, nice looking salad. Sunflower sprouts are so fresh and great. I know! It’s one of those “duh” ideas!!! I really love dill in hummus too, after just discovering the combination this week! I’m going to blog about it before the weekend, so stay tuned! why have I never considered parsley to add to my hummus? A million other things, but never parsley. I guess the idea was waiting for YOU to bring it to us. I’ve got some parsley in my fridge and a hummus longing in my belly. Tonight’s the night!! Love it 🙂 let us know how you like it!! !